Back in 1978 an outdoor amphitheatre was built on the banks of the Grand River behind Galt Collegiate Institute and Vocational School. With 400 seats, a stage and a phenomenal view, the amphitheatre was built through support of the community, the school and grant money from the provincial government. In January 2019, the Waterloo Region District School Board stated they wanted to demolish it. This is one woman’s thoughts on the matter and why she feels it should be saved. Updates will be included in the bottom of this post. It was a perfect fall night. The sun had gone down over golden trees and there was excitement in the air. A bundle of nervous energy and excitement for what was to come. Bundled in my sweater and jeans, I trekked down the ramp behind Galt Collegiate Institute and into the first of many social events in my high school years. Not just any Coffee House, this one was going to be outside. A coffee house in an amazing amphitheatre overlooking the Grand River. Like many former GCI students, the annual Coffee House would be my introduction to the amphitheatre which would soon become one of my favourite spaces of the school. 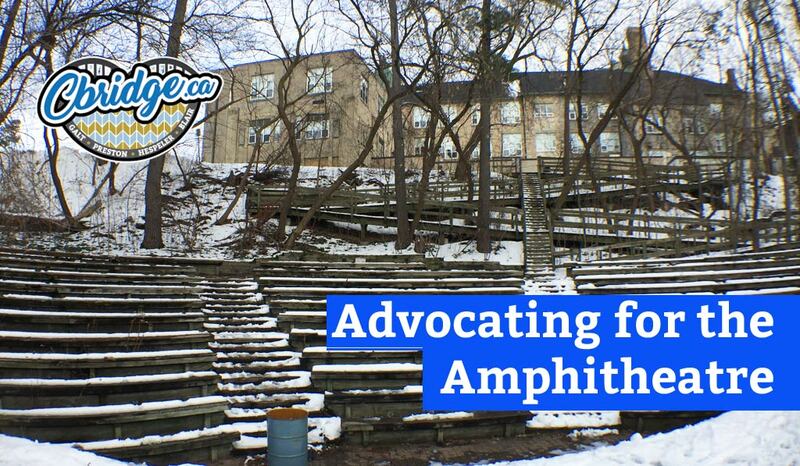 Set in the hillside along the Grand River, and nestled under the CP train bridge, the amphitheatre has wooden bench seating and a cement stage with stairs just begging for someone to put on a performance. It was a quiet area for me on more than one occasion where I could let my hair down and just be silly. Many dorky renditions of Green Day and mock performances of Shakespeare that ended in fits of laughter have happened on that stage. To say that it is a bigger part of my high school years than the famed Tassie Hall is an understatement. Flash forward to the winter of 2017. When taking my little family on a hike to capture pictures for cbridge.ca we came across the amphitheatre. The stage was still there in all it’s glory. It had a little more graffiti than I remember but the structure was still there. The seating and steps were still in place, some rotting away but still there. I had so much joy seeing the space and recollecting stories of my youth. We pondered what would happen now, as the amphitheatre appeared to have been forgotten. And then January 22, 2019 happened. The Waterloo Region Record came out with an article about the amphitheatre that made my heart sink. $500,000 is needed to restore the space and the Waterloo Region District School Board isn’t ready to do it. With cuts left and right by the province, it really can’t be that surprising. There are elementary schools across the region which are begging to have playground upgrades, why would the school board put money into something that is underutilized by its students? At first, I was heartbroken. And then I started talking. Everyone that I talked to made me more and more anxious to do something. To somehow help save this gorgeous space from being forgotten. Save it for all those kids that needed a place to go to convene with nature during stressful high school days. Save it for the community that for the most part doesn’t even know it exists. Cambridge is a wonderful city. We have fantastic parks and schools, businesses and neighbourhoods. It always amazes me how many times we post pictures from around our city through this blog and people ask us where we took them. The Amphitheatre is one of those spaces that you didn’t know was there but kind of wish you did. Thus begs the question – how can we save this space? The school board doesn’t have the money. The City alone isn’t going to save it. The only thing that can save it is us. All those that have loved the space and want to love the space in the future. All those that can see the greatness that can happen there. Outdoor music performances in a peaceful backdrop. Another stage for festivals like the incredibly popular Mill Race Folk Festival where you don’t need to close a road. A spot for the Cookies and Kids Theatre to have summer performances in a shady spot. A fantastic location for Toastmasters or budding actors to practice projecting their voice. A stage for local dance students to practice and perform their routines. $500,000 is a lot of money though. Can we do it? Can we work together and make it happen? A cross-generational group has already started organizing to see what can be done. Can we “raise the barn” and bring the amphitheatre to life again? What do you think? Should we save it? Do you want to help save it? Or should it be left to nature as it has been for so many years. On Monday March 18, 2019, I was part of a multi-generational delegation that met with the Waterloo Region District Schoolboard to discuss why it was so important for not just the students, but alumni, neighbours and community members to have a say on what happens in this space. I am happy to report that our impassioned plea was successful! Another item our delegation spoke about was the need for a public/private partnership as the best option for the future of the amphitheatre and the school board is going to take that into consideration. Starting in April, a consultation will start that will last approximately 6 weeks. During that time there will be a public meeting (likely at GCI) and an online survey. (More details to come). A Facebook group has been organized for those that want to help and have their say. Feel free to join the group and stay informed as we haven’t yet saved this unique space from the wrecking ball. Yes! We should try to save it. I think I was a few years behind you at GCI, I graduated in 2000. Like you, I have fantastic memories of Coffee Houses. I can try to help. Please include me on any updates. Hi Kelly, I know it’s last minute but a group is meeting today (Feb 23rd) at 3pm at Monigrams in the room upstairs. If you can, I’m sure we’d love to see you there! Yes, I absolutely hope the amphitheater is saved. There isn’t a more beautiful outdoor venue for students to enjoy in the entire tri city. It would be a real tragedy to see it disappear. Hi Robert, I know it’s last minute but a group is meeting today (Feb 23rd) at 3pm at Monigrams in the room upstairs. If you can, I’m sure we’d love to see you there! Good to know! Send me an email to [email protected] and I will get you in touch with a group that wants to save the space.